Hi there, it’s me again, Fleurine from Sew Mariefleur! After showing you dresses in my two previous posts, I’ve made something much more suitable for winter this time around – a Denver Tunic. I really like how princess seams just make everything fit so well, and since this month’s theme is “sewing with knits,” the Denver Tunic was the perfect choice. Once again I chose fabrics from LA Finch Fabrics for this outfit. The main fabric is one that was never sold at LA Finch Fabrics, since Josie, the owner, considered it “flawed.” It looks horrible (sarcasm mode *on*), doesn’t it? But I loved the subtle waffle texture and the super soft brushed back, and I got two metres for free with my last order. The black panels are also made of fabric from LA Finch Fabrics; it’s a soft and stable ponte, a leftover from a recent make. 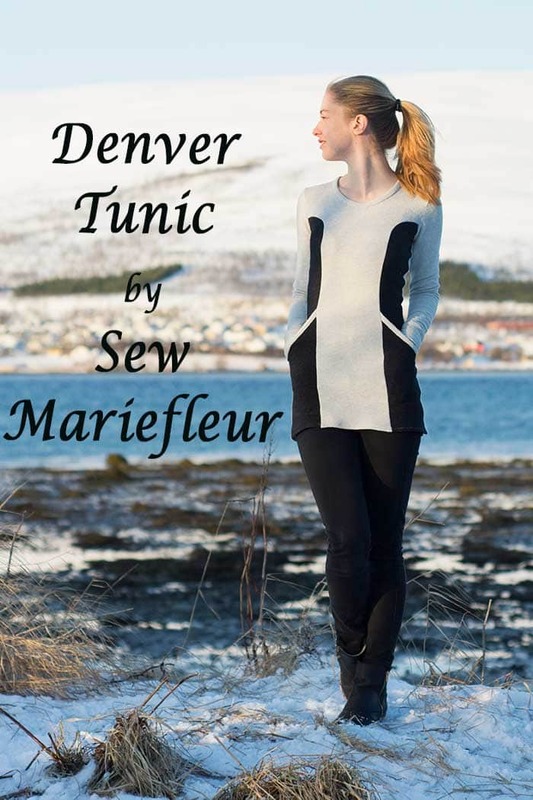 The Denver Tunic and Dress comes as a slim fit or flared dress, or as a tunic like I made. 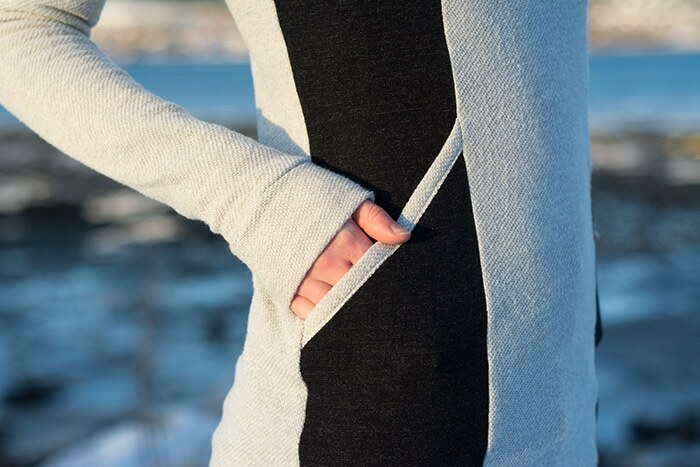 You can choose between a round neck or a cowl neck version, and between different sleeve lengths, too. 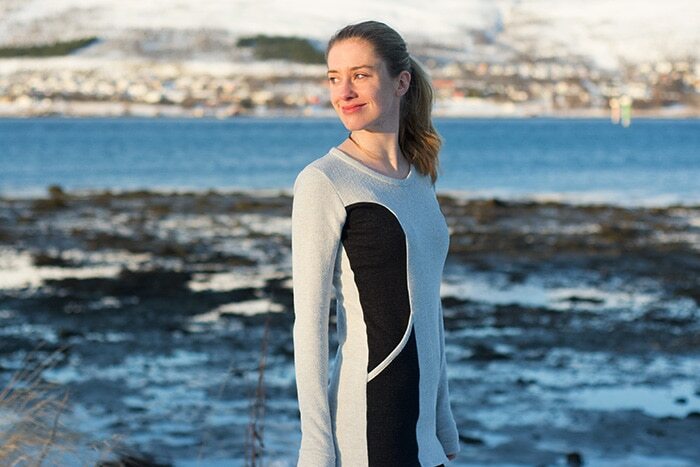 I chose to sew the round neckline, but since the winter is pretty cold up here in Northern Norway I didn’t like how deep the neckline was. The solution was simple, I just raised the front neckline about 1″ or so and am very happy with the result! I also chose to skip the band at the hem, since my side panels are black and I didn’t want to piece the waistband together, and I didn’t want a solid coloured band, either. I lengthened the bodice slightly at the lengthen/shorten line, and added about two inches to the bottom of all bodice pieces, including the pockets. Another adjustment I made was the way I added the neckline band. I chose to sew it like a binding, using the same method I used for binding the pockets. I wanted the pocket binding and the neckline binding to “match,” and I really like the slightly “bulky” look of the neckline band. My main fabric has just a minimal amount of stretch, so this Denver Tunic is hugging every curve! It’s not a problem at all, and the sweater is highly wearable, it’s just not very suitable for layering or pulling up your sleeves. Sewing the Denver Tunic is pretty straight forward, and the princess seams ensure a great fit and are easy to adjust too, in case you need more or less room at the bust. And have I mentioned how much I love the big pockets?? All in all it’s a super cozy sweater, and not a difficult project at all – especially if using stable knits like I did.